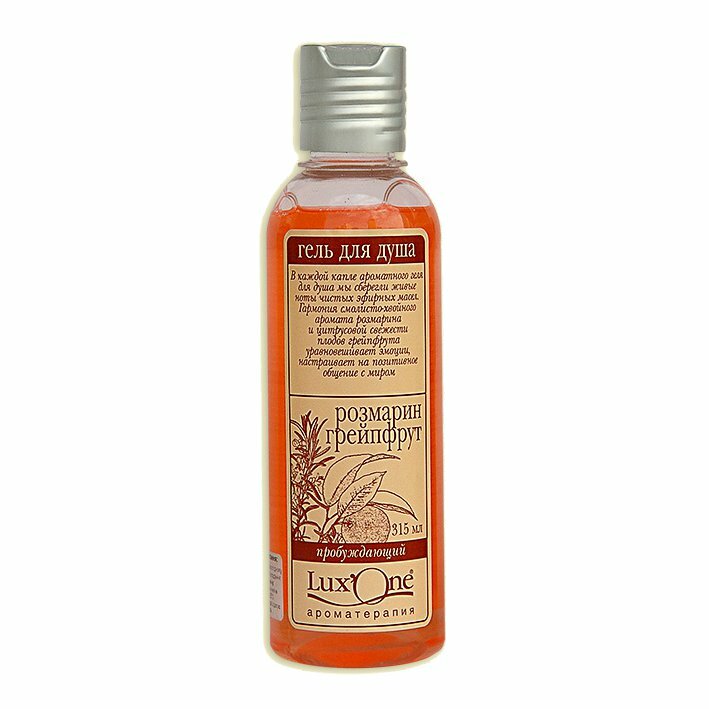 Rosemary & Grapefruit Energising Shower Gel is produced by the Ukrainian beauty brand LuxOne. The product is formulated with rosemary essential oil and grapefruit essential oil. It is an excellent body care product that will transform your routine shower into a luxurious spa ritual. This shower gel has a fresh scent that boosts your mood, helps to calm down and relieves stress. The product lathers well and cleanses your skin from dirt and grime gently yet effectively. It makes your skin softer and smoother, helps to keep it clean and fresh for hours, has a moisturising effect. The aroma of grapefruit essential oil gives a mood boost, has a refreshing and balancing effect. It facilitates positive communication with people around you and helps to achieve mutual understanding. This active aroma will give your self-confidence a boost and recharge your batteries for the day. Rosemary oil also has an energising effect, but it is primarily valued for its ability to improve memory. Rosemary aroma enhances brain function and makes it easier to memorise names, numbers and even foreign words. It is recommended to use rosemary oil while preparing for exams. Directions. Apply a small amount of gel onto a wet palm or sponge. Spread over the skin. Rinse thoroughly. Ingredients. Aqua, Sodium Laureth Sulfate, Sodium Cocoyl Glutamate, Modified Polymer, Rosemary Essential Oil, Grapefruit Essential Oil, Colourants, Parfum, Citric Acid, Preservative, Synthetic Wax. Want to buy Rosemary & Grapefruit Energising Shower Gel? Call us or submit your order via our web site! LuxOne (also spelled Lux'One) is a Ukrainian brand of natural cosmetics produced by the perfume and cosmetic factory Arosa. The products manufactured by this factory are well-known to consumers in Ukraine and its neighbouring countries thanks to another popular cosmetic band, Aromatika. Arosa launched is first cosmetic series in 2002. Since then, its beauty products have become quite popular in Ukraine and abroad. The factory produces a wide range of products formulated with natural ingredients such as essential oils, vegetable oils, herbal extracts, sea salt. All the products have quality and hygiene certificates issued by the Ministry of Health of Ukraine. Specialists of the company regularly attend international exhibitions, participate in cosmetic congresses and forums to improve their professional skills and exchange experience with their foreign colleagues. Arosa's LuxOne series comprises high-quality essential and vegetable oils, handmade soaps, liquid soaps, shower gels, intimate washes, foot deodorants and antiperspirants, face masks, bath foams, bath salts and other products. In LuxOne cosmetics, all useful properties of natural vegetable and essential oils are combined with modern scientific accomplishments. These products are effective, affordable, safe for your health and the environment. Take care of yourself with LuxOne!